My absolute #1 F.A.Q. 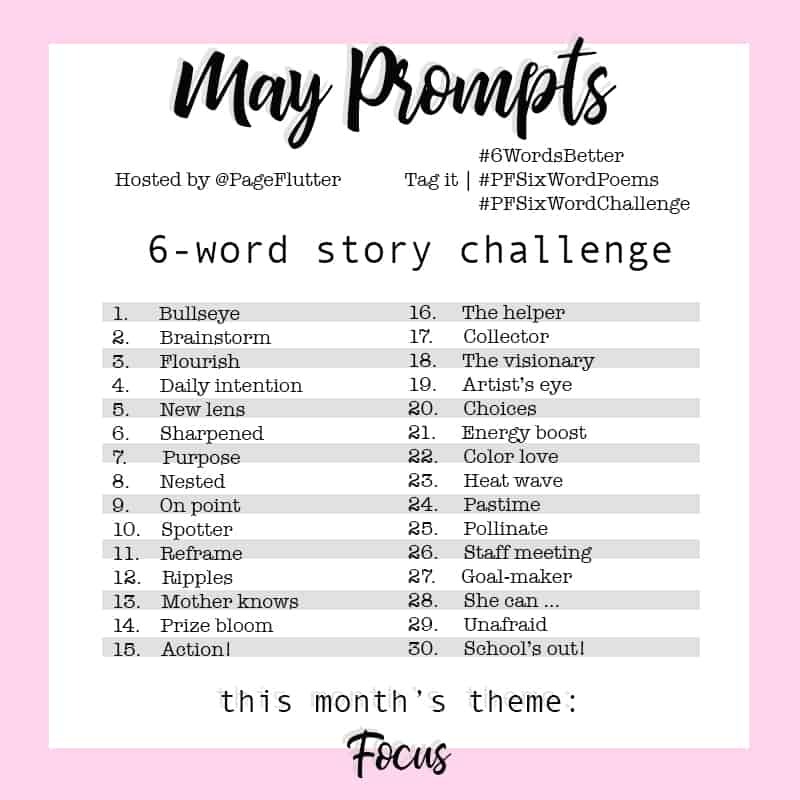 is about Bullet Journaling supplies. What are my favorites? 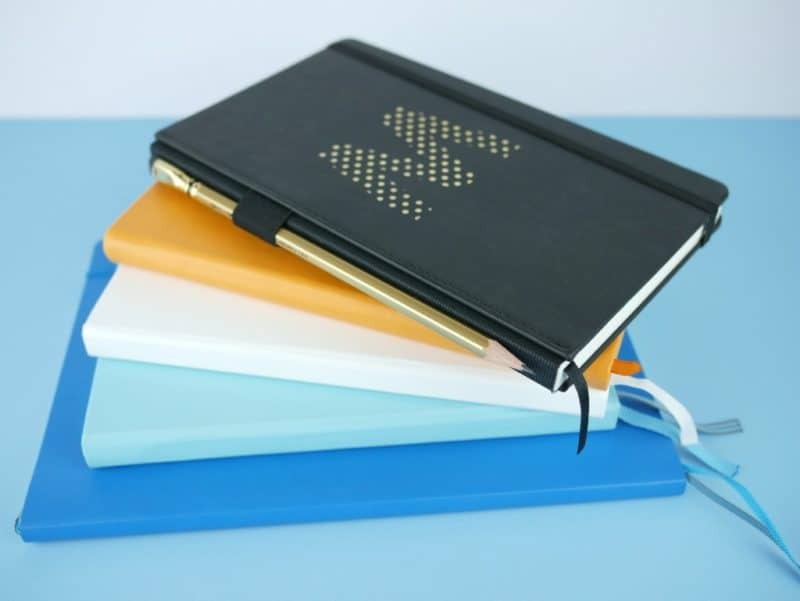 Which notebook is best? Which pen won’t bleed through the page? With so many options out there, I can see why people are confused. I’ll let you in on a little secret: Supplies won’t make or break your journal. The trick is to find supplies you enjoy using, otherwise you won’t keep up with a journaling habit. Quality does matter, though, especially when it comes to notebooks. Keep in mind you’ll be using these items every day for months at a time. 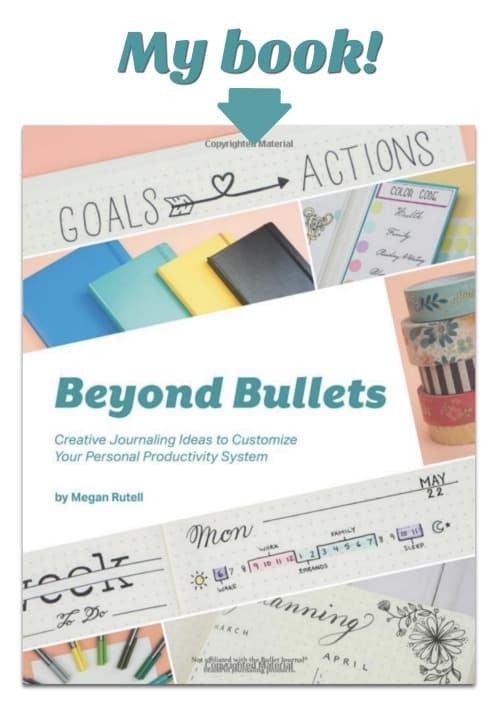 These aren’t the only quality options out there, but you can consider them my tried-and-true favorite bullet journal supplies. This post and the photos within it contain affiliate links. When you make purchases through these links I may receive a small commission at no extra cost to you. Scribbles That Matter (Pro): Scribbles That Matter has generated a lot of buzz in the journaling community. The paper quality is excellent and is popular among people who dislike “ghosting” (when writing on one side of the page is visible through the other side). It also comes with a pre-printed index and key, pre-numbered pages, two ribbon markers, and a pocket in the back cover. It comes in a couple of different versions: The Iconic version is decorated with doodle-like icons on the cover. The Pro version has a simpler cover for a more professional appearance. Both versions come in a variety of awesome colors. Leuchtturm1917 Dotted, A5: This was my first “serious” notebook for bullet journaling. It comes in blank, lined, grid, or dot grid. I prefer the dot grid version (FYI: Dotted versions have no header, squared versions have a date line at the top of each page). 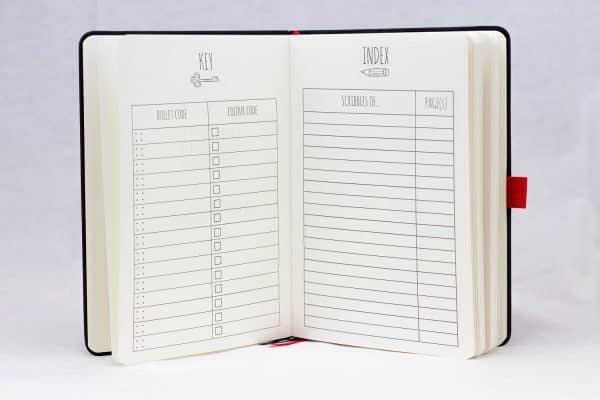 This puppy has a pre-printed index, a pocket, two ribbon markers, an elastic closure, and 249 numbered pages. The paper is ivory, so it’s easy on the eyes, and the dot grid is an unobtrusive light grey. 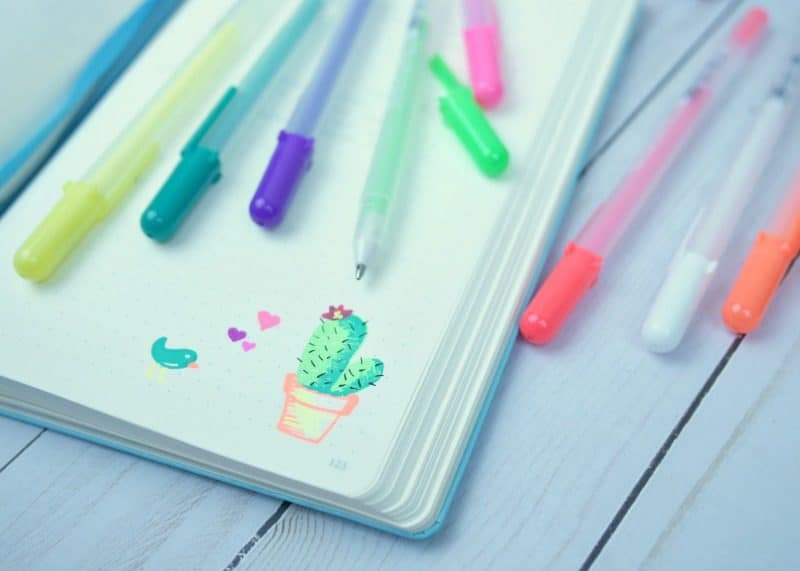 It comes in a huge assortment of colors, too, making it a super choice for bullet journaling. 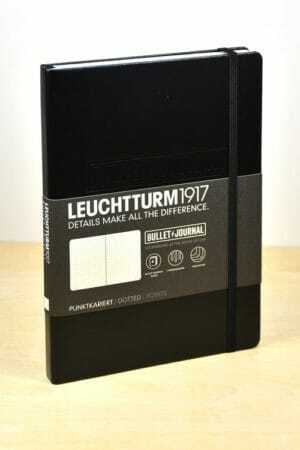 Official Bullet Journal (by Leuchtturm1917): As the official notebook of the Bullet Journal brand, you can’t go wrong with this one. 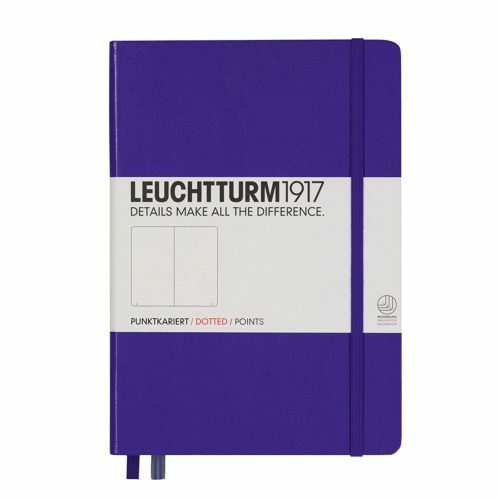 It has all the features of the regular LT1917 notebooks, plus an extra ribbon marker and a guide to Bullet Journaling in the first few pages of the notebook. 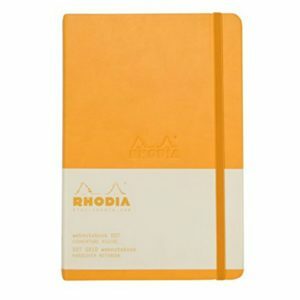 Rhodia Webnotebook: The best paper on the planet. Period. The pages are not numbered, and there’s no index, but the paper makes up for it all. This notebook has a pocket, ribbon marker, dot grid pages, an elastic closure. You can see my full review of it >>HERE<<. 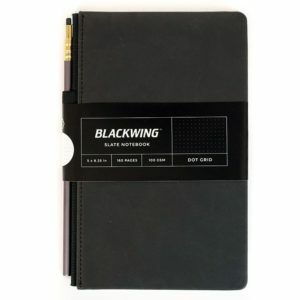 Blackwing Slate Dotted notebook: I like this notebook for the opacity of the pages. It has the least ghosting of any notebook I’ve tried. It also has a pocket, ribbon marker, dot grid pages, an index, an elastic closure, and a pencil holder sewn onto the spine. Pages are not numbered. It’s available at J*B Welly. >>For more notebook options, check out my post 8 Swoon-Worthy Notebooks for Bullet Journaling. 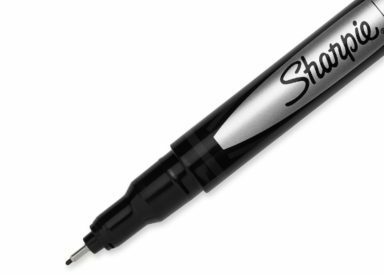 Sharpie Pens: My take-everywhere-use-and-abuse pens. 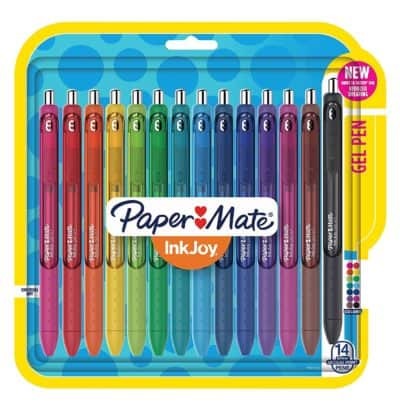 I love these pens.They’re comparable to Faber-Castell PITT Artist Pens, but more affordable. The fine tips are perfect for drawing spreads, doodling, or everyday writing in my bullet journal. The ink isn’t quite as dark as the Faber-Castells, but I notice the tips don’t dry out as badly, either. For some reason, I always grab my Sharpies first. Faber-Castell PITT Artist Pens: These are super dark fine-tipped artist’s pens. I like the line I get when writing with these because it’s so black it looks like it’s floating in front of the paper. Once the ink is dry, they won’t smear or fade over time. You can get them in a variety of sizes, so play around with them until you find the line you like. Energels: If you prefer a gel pen, this one has one of the darkest black inks I’ve found. I also like the purple version (pictured above, 3rd from the left). It’s one of my favorite colors of purple ink. FriXion Erasable Gel Pens: The black version isn’t quite as dark as I would like, but the other colors are fantastic. I use these for my schedule, since things change so often. Try these if you are shy about making mistakes in your journal. There’s a full review >>HERE<<. Lamy Safari: My second favorite fountain pen. I like this one because it’s lightweight, comes in lots of colors, and it you can change out the nibs. It’s also very affordable. If you’re new to fountain pens, the Lamy is good to start with. Pilot Metropolitan (Fine Nib): My White Tiger Metropolitan is my favorite fountain pen. It feels great in the hand, had a nice weight to it, and the line is just right for me. It’s an amazing pen for the price. Pilot Metropilotan (Medium Nib): I bought my medium nib Metro before I got the White Tiger (Fine). I often find the medium nib too thick for my liking. If you take lots of fast notes, you may prefer this nib because it keeps up with quick writing. Gelly Roll Moonlight: Gelly Rolls take me back to middle school. The Moonlight collection is especially nice because they’re completely opaque and show up on any color paper. The pop of color will cheer up any page. Staedtler Triplus Fineliner Pens: These are great for writing or artistic pages. They’re super fine, so you can use them to color in tight space or practice faux-calligraphy. I ordered the set that comes with this handy dandy rollup case. The black pen in this set is also lovely for everyday writing. Just grab your rollup and a nice notebook, you would have everything you need. 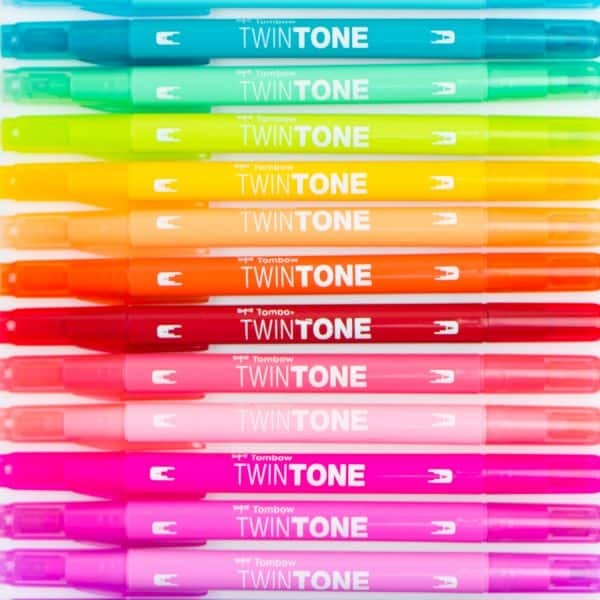 Tombow TwinTone Planner Pens: Even though I didn’t need any new colored pens, I could resist these beauties when Tombow released them. I ordered the pastels first. When they came, I hopped right back onto the website and ordered the bright pack! The best thing about these pens is they have two tip sizes on each marker. The fine side is perfect for detailed doodles or coloring small spaces. 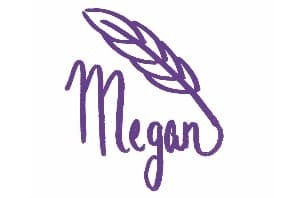 The medium size is ideas for headers and borders. My Tombows have a permanent place on my desk! Papermate Flair: Flairs are a nostalgic experience for me. They’ve always been my favorite red pen for editing. 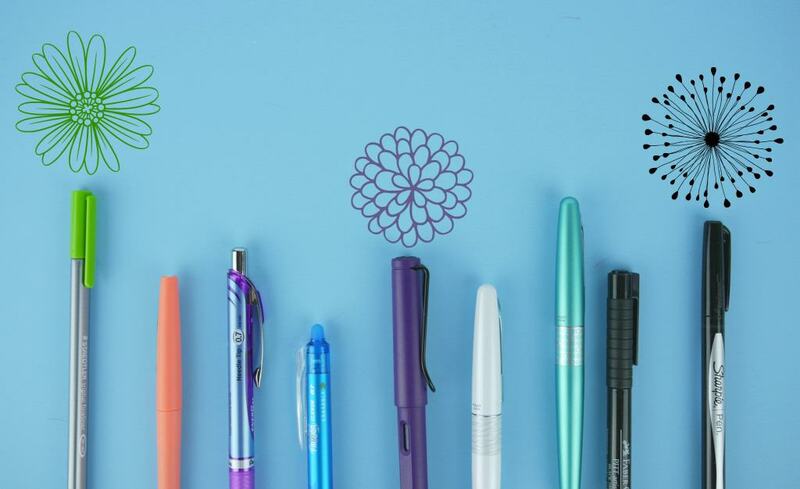 They come in a huge variety of colors, they’re comfortable to write with, and don’t bleed through the page. 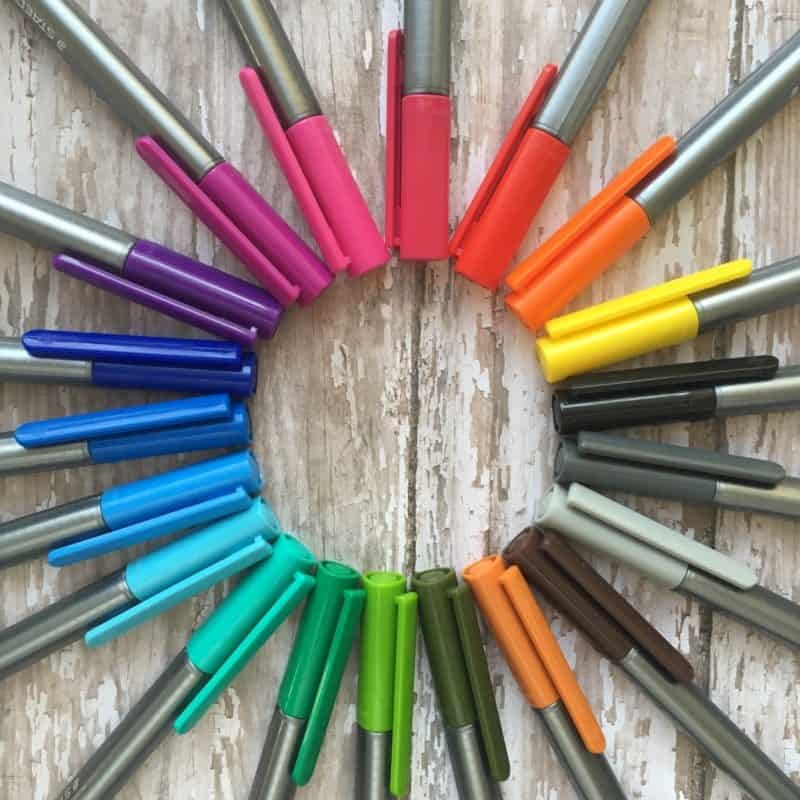 Inkjoy Gel Pens: So many colors, and so smooth! These are great for colorful writing in your journal, whether you love to color-code your bullets or fill up a page with your thoughts. Prismacolor: When I get in an especially artsy mood, I like to add fun pictures to my journal. Not that I consider myself an immortal artist, but doodling and sketching can be great fun. I talk more about my Prismacolors in this post >> How to Add Images to Your Bullet Journal (Even if You Can’t Draw). Helix Circle Maker: THE tool for drawing circles in your journal. I tried many different compasses before finding this handy little guy. The outer ring stays stationary on the page while the inside spins to make the circle. 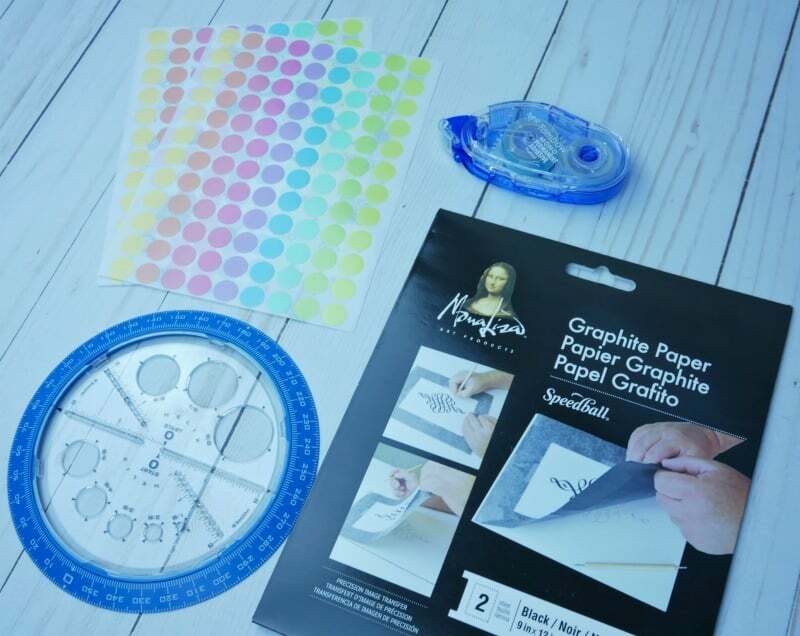 Colored Dot Stickers: The brand I have (this one) is currently unavailable on Amazon, but I also found others that are very similar. I use these to label my page edges. I talk all about page labeling >>HERE<<. Graphite Paper: I’m not particular about what brand I buy. Whetever’s handy. Sometimes I get it on Amazon, sometimes I grab it at the art supply store. It helps if you need to transfer something complicated into your journal, like a map. Tombow Mono Permanent Adhesive Tape: I like how portable this adhesive tape is. I can keep it in my purse without worrying about spills. Then I can tack business cards or papers right into my journal. If you want something a little more seamless, try a liquid adhesive like this one.